Do you live in Pensacola? Pensacola (/ˌpɛnsəˈkoʊlə/) is the westernmost city in the Florida Panhandle and the county seat of Escambia County,Florida, United States. As of the 2010 census, the city had a total population of 51,923. Pensacola is the principal city of the Pensacola metropolitan area, which had an estimated 461,227 residents in 2012. Pensacola is a sea port on Pensacola Bay, which is protected by the barrier island of Santa Rosa and connects to the Gulf of Mexico. A large United States Naval Air Station, the first in the United States, is located southwest of Pensacola (near Warrington); it is the base of the Blue Angels flight demonstration team and the National Naval Aviation Museum. The main campus of the University of West Florida is situated north of the city center. The area was originally inhabited by Muskogean peoples; the Pensacola people lived there at the time of European contact and Creek people frequently visited and traded from present-day southern Alabama. Spanish explorer Tristán de Luna founded a short-lived settlement in 1559. In 1698 the Spanish established a presidio in the area, from which the modern city gradually developed. The area changed hands several times as European powers competed in North America. During Florida's British rule (1763–1789), fortifications were strengthened. It is nicknamed "The City of Five Flags," due to the five governments that have ruled it during its history: the flags ofSpain (Castile), France, Great Britain, the United States of America and the Confederate States of America. Other nicknames include "World's Whitest Beaches" (due to the white sand of Florida panhandle beaches), "Cradle of Naval Aviation", "Western Gate to the Sunshine State", "America's First Settlement", "Emerald Coast", "Redneck Riviera", "Red Snapper Capital of the World", and "P-Cola". The original inhabitants of the Pensacola Bay area were Native American peoples. At the time of European contact, a Muskogean-speaking tribe known to the Spanish as the Pensacola lived in the region. This name was not recorded until 1677, but the tribe appear to be the source of the name "Pensacola" for the bay and thence the city.Creek people, also Muskogean-speaking, came regularly from present-day southern Alabama to trade, so the peoples were part of a broader regional and even continental network of relations. The best-known Pensacola Culture site in terms of archeology is the Bottle Creek site, a large site located 59 miles west of Pensacola north of Mobile, Alabama. This site has at least 18 large earthwork mounds; five of which are arranged around a central plaza. Its main occupation was from 1250CE to 1550. It was a ceremonial center for the Pensacola people, and a gateway to their society. This site would have had easy access by a dugout canoe, the main mode of transportation used by the Pensacola. The area's written recorded history begins in the 16th century, with documentation by Spanish explorers who were the first Europeans to reach the area. The expeditions of Pánfilo de Narváez in 1528 and Hernando de Soto in 1539 both visited Pensacola Bay, calling it the Bay of Ochuse. In 1559, Tristán de Luna y Arellano landed with over 1,400 people on 11 ships from VeraCruz, Mexico. The expedition was to establish an outpost, called Ochuse by de Luna, as a base for Spanish efforts to colonize Santa Elena (present-day Parris Island, South Carolina.) But, the colony was decimated by a hurricane on September 19, 1559, which killed hundreds, sank five ships, grounded a caravel, and ruined supplies. The 1,000 survivors divided to relocate the settlement, but due to famine and attacks by the Pensacola, they abandoned their effort in 1561. About 240 people sailed to Santa Elena, but another storm hit there. Survivors abandoned the settlement and sailed to Cuba. The remaining 50 at Pensacola were taken back to Mexico. The Viceroy's advisers concluded northwest Florida was too dangerous to settle, a view which stood for 135 years. Presidio San Miguel de Panzacola (1754–1763): the final presidio was built about five miles east of the first presidio; the present-day historic district of downtown Pensacola, named from "Panzacola", developed around the fort. During the early years of settlement, a tri-racial creole society developed. As a fortified trading post, the Spanish had mostly men stationed here. Some married or had unions with Pensacola, Creek or African women, both slave and free, and their descendants created a mixed-race population of mestizos and mulattos. The Spanish encouraged slaves from the southern British colonies to come to Florida as a refuge, promising freedom in exchange for conversion to Catholicism and militia service. Most went to the area around St. Augustine but escaped slaves also reached Pensacola. After years of settlement, the Spanish ceded Florida to the British in 1763 as a result of an exchange following British victory over France in the French and Indian War (the North American front of the Seven Years' War), and French cession of its territories in North America. The British designated Pensacola as the capital of their new colony of West Florida. From 1763, the British strengthened defenses around the mainland area of fort San Carlos de Barrancas, building the Royal Navy Redoubt. 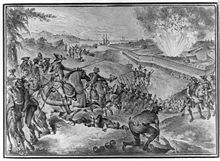 After Spain joined the American Revolution in 1779 on the side of the rebels, Spanish forces captured the city in the 1781 Battle of Pensacola, gaining control of West Florida. After the war the British officially ceded both West Florida and East Florida to Spain. In 1785 with the founding of the Panton, Leslie Company here, many Creek from southern Alabama and Georgia came to trade, and it developed as a major center. It was a garrison town, predominately males in the military or trade. Americans made raids into the area, and settlers pressured the federal government to gain control of this territory. In 1819 Spain and the United States negotiated the Adams-Onis Treaty, by which Spain sold the Floridas to the United States for US$5 million. A Spanish census of 1820 indicated 181 households in the town, with a third of mixed-blood. The people were predominately French and Spanish Creole. Indians in the area were noted through records, travelers' accounts, and paintings of the era, including some by George Washington Sully and George Catlin. Creek were also recorded in marriages to Spanish men, in court records or deeds. In 1821, with Andrew Jackson as provisional governor, Pensacola became part of the United States. The Creek continued to interact with European Americans and African Americans, but the dominant whites increasingly imposed their binary racial classifications: white and black ("colored", within which were included free people of color, including Indians.) But, American Indians and mestizos were identified separately in court and Catholic church records, and as Indians in censuses up until 1840, attesting to their presence in the society. After that, the Creek were not separately identified as Indian, but the people did not disappear. Even after removal of many Seminole to Indian Territory, Indians, often of mixed-race but culturally identifying as Muskogean, lived throughout Florida. St. Michael's Cemetery was established in the 18th century at a location in a south central part of the city, which developed as the Downtown area. Initially owned by the Church of St. Michael, it is now owned and managed by St. Michael's Cemetery Foundation of Pensacola, Inc.Preliminary studies indicate that there are over 3200 marked burials as well as a large number unmarked. Tensions between the white community and Indians tended to increase during the Removal era. In addition, an increasing proportion of Anglo-Americans, who constituted the majority of whites by 1840, led to a hardening of racial discrimination in the area.There was disapproval of white men living with women of color, which had previously been accepted. In 1853 the legislature passed a bill prohibiting Indians from living in the state, and provided for capture and removal to Indian Territory. In 1907-1908 there were 116 Creek in Pensacola who applied for the Eastern Cherokee enrollment, thinking that all Indians were eligible to enroll. Based on Alabama census records, most of these individuals have been found to be descendants of Creek who had migrated to the Pensacola area from southern Alabama after Indian removal of the 1830s. As of the census of 2010, there were 51,923 people, 23,600 households, and 14,665 families residing in the city, and 402,000 people in the Pensacola MSA. The population density was 2,303.5 people per square mile (956.8/km²). There were 26,848 housing units at an average density of 1,189.4 per square mile (459.2/km²). The racial makeup of the city is 66.3%White, 28.0% African American, 2.0% Asian, 0.6% Native American, 0.1% Pacific Islander, 2.3% from two or more races. 3.3% Hispanic or Latino of any race. Out of the total population in Pensacola, 45.9% identify with a religion, slightly lower than the national average of 48.34%.Over 48% of Pensacolians who practice a religion identify as Baptists (22.14% of all city residents). Other Christian denominations include Roman Catholics (9.22% of city residents), Pentecostal (3.82%), Methodist (3.77%), Episcopal (1.11%), Presbyterian (1.08%), and Orthodox (0.30%). Pensacola is home to a small (0.15% of city residents) but significant Jewish community, whose roots date mostly to German Jewish immigrants of the mid-to-late 19th century. There were also Sephardic Jewish migrants from other areas of the South, and immigrants from other areas of Europe. The first Florida chapter of B'nai Brith was founded downtown in 1874, as well as the first temple, Beth-El, in 1876. Apart from the Reform Beth-El, Pensacola is also served by the Conservative B'nai Israel Synagogue.Paula Ackerman, the first woman who performed rabbinical functions in the United States, was a Pensacola native and led services at Beth-El. Jurisdictions outside the city have opposed its overtures to annex more area. With limited geographic area, the city has held its 2000 Census population figure at 56,255. The City of Pensacola utilizes a strong mayor-council form of government, which was adopted in 2011 after citizens voted in 2009 to approve a new city charter. An elected mayor, currently Ashton Hayward, serves as the chief executive of the city government, while an eight-member City Council serves as the city's governing body. A Council President, who presides over meetings of the Council, is selected by the Council from its members, along with a Vice President. City voters approved a charter amendment on June 11, 2013 which eliminated the then-nine member Council's two large seats; one seat was phased out in November 2014, and the other will expire in November 2016. Two additional charter amendments were approved on November 4, 2014 which made the position of mayor subject to recall and provided the City Council with the authority to hire staff. The current City Hall was opened in 1986. Like other parts of the South during Reconstruction, Pensacola was solidly Republican for years after the Civil War. The Republican government had numerous African American politicians, including several county commissioners, city aldermen, constables, state representatives, and even one African American Mayor—Salvador Pons. However, with the 1884 election of native Pensacolan and former Confederate General Edward Perry, a dramatic shift occurred. Perry, a Democrat who actually lost the Escambia County vote during the state-wide election, acted to dissolve the Republican city government of Pensacola and in 1885 replaced this government with hand-picked successors, including railroad magnate William D. Chipley. The only African American to remain in city government was George Washington Witherspoon, a pastor with the African Methodist Episcopal Church who was previously a Republican and switched parties to the Democrats. Following Governor Perry's dissolution of the Republican government, the city remained Democratic for more than a century after the Civil War with no African Americans serving in an elected capacity for nearly a century. As was the case in most of Florida, the Democratic primary was the real contest for most state and local elections until the 1970s. However, from the 1960s onward, the staunchly conservative military and Bible Belt city became increasingly Republican at the national level. Despite this, Democrats continued to win most elections at the state and local level well into the 1990s, though most of them were very conservative even by Southern Democratic standards. This changed in 1994, when Republican attorney Joe Scarborough defeated Vince Whibbs, Jr. the son of popular former Democratic mayor Vince Whibbs, in a landslide to represent Florida's 1st congressional district, which is based in Pensacola. Republicans also swept all of the area's seats in the state legislature, the majority of which were held by Democrats. Since then, Republicans have dominated every level of government, although municipal elections are officially nonpartisan. In August 2005, registered Republicans outnumbered Democrats for the first time in the area's history. As of August 2005, in Escambia County, 44% of the residents are registered Republicans compared to 39.91% of the population having registered as Democrats with another 13.21% having no party affiliation. In the 2004 presidential election, 65% of Escambia County residents voted for George W. Bush over John Kerry. The Pensacola area has not supported a Democrat for President since John Kennedy in 1960. In 1968, Pensacola and the rest of North Florida supported American Independent Party candidate George Wallace. Pensacola is currently represented in the U.S. House of Representatives by Jeff Miller (R), in the state senate by Greg Evers (R), and in the state house by District 1 Rep. Clay Ingram (R) and District 2 Rep. Mike Hill (R).